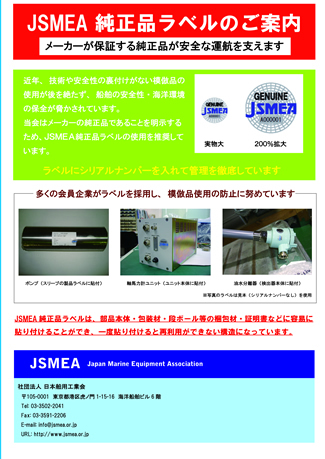 The Japan Ship Machinery and Equipment Association (JSMEA) has continued to implement countermeasures against non-genuine products with support from Japan’s Ministry of Land, Infrastructure, Transport and Tourism (MLIT) and other relevant organizations since setting up in 2002 a dedicated council comprising 36 member companies, the Countermeasure Council Meeting against Counterfeit Products, to address the problem of non-genuine products. 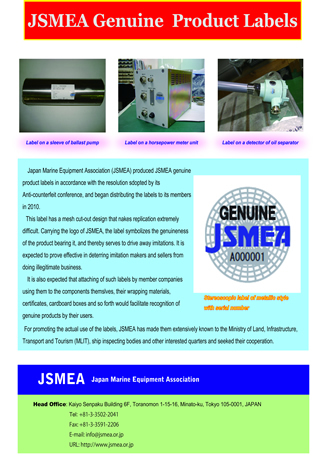 In 2012, the JSMEA produced the JSMEA Genuine Products Label to clearly show that ship machinery and equipment with the labels are genuine products. Genuine products can be managed thoroughly with serial numbers. The JSMEA would like to have the JSMEA Genuine Products Label widely recognized by the MLIT, ship inspection authorities and other relevant organizations and to encourage cooperation with its efforts. The JSMEA asks for your company’s understanding of the reasons for producing the JSMEA Genuine Products Label and to use it fully.